(February 1, 2012) China’s cyber citizens, or ‘netizens’ as they are known, are forcing their government to come clean-er on air pollution. Officials claim air quality in China’s urban centers is improving constantly, but the reality is less reassuring when smog smothered cities are the norm, year in and year out. After Steven Q. Andrews, an environmental consultant based in Beijing, accused Beijing’s Environmental Protection Bureau of deliberately keeping damning data about pollution levels from the public late last year, citizens began purchasing monitors for themselves — even selling oranges to raise money for equipment — posting air quality readings on the Internet for public circulation. First reported last November by Probe International’s Chinese Internet monitor, Weibo Watch, and again last month, this New York Times report finds China’s edifice of environmental propaganda is collapsing: the country’s grassroots activist networks are forcing the government to come clean-er. 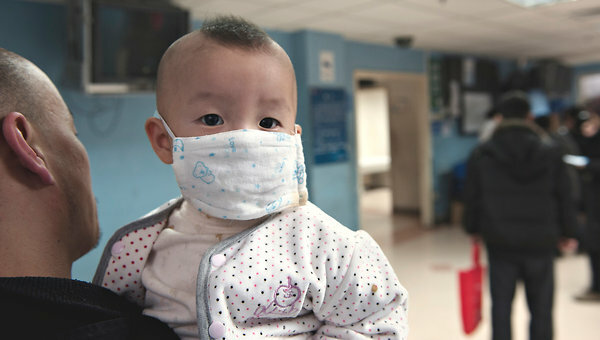 Chinese parents with children suffering from respiratory ailments, possibly caused by air pollution, flock to the Capital Institute of Pediatrics in Beijing. Gilles Sabrie for The New York Times. Weary of waiting for the authorities to alert residents to the city’s most pernicious air pollutant, citizen activists last May took matters here into their own hands: they bought their own $4,000 air-quality monitor and posted its daily readings on the Internet. That began a chain reaction. Volunteers in Shanghai and Guangzhou purchased monitors in December, followed by citizens in Wenzhou, who are selling oranges to finance their device. Wenzhou donated $50 to volunteers in Wuhan, 140 miles inland. Officials have claimed for years that the air quality in fast-growing China is constantly improving. Beijing, for example, was said to have experienced 286 “blue sky” days in 2011, a statistic belied by the heavy smog smothering the city for much of the year. But faced with an Internet-led brush fire of criticism, the edifice of environmental propaganda is collapsing. Continue to the story, listed here. For the original article, see here. China quietly shelves new diesel emission standards (February 1, 2012) It ought to have been a centrepiece of China’s efforts to reduce smog, but the government has quietly postponed plans to clean the fumes from truck and bus exhaust pipes. The 18-month delay of new diesel emission standards, runs contrary to the authorities’ promises to tighten controls on air pollution.